Navigating the troubled waters of social media can feel incredibly daunting, particularly for businesses trying to make an impact. Fortunately, social media management services can improve your reach and increase your authority, and you won’t have to lift a finger – you’ll have dedicated experts working to make your brand a social media success. With 65 million business pages on Facebook alone, getting your company noticed on social media is competitive enough as it is. Combine this serious saturation problem with confusing algorithms and changes to best practice, and social media maintenance can feel more like an annoying problem than a helpful solution. With expert social media management services available though, you’ll have nothing to worry about. They’ll plan your strategy, execute consistently, and engage your audience in a way that will improve your bottomline and establish your company’s authority all in one fell swoop. Finding the right social media management service for your company isn’t immediately obvious. It’s a competitive market, and by their nature, these companies are good at self promotion! So, how can you tell which is best for your business? Fortunately, we’ve rounded up a few of the best social media management services, so you can easily find experts who will take your business from vacant to viral. Lyfe Marketing is one of the highest-rated social media management services on the market. Based in Atlanta, GA, this all-in-one service can help your small- to medium-sized business make an impact on Facebook, Twitter, Instagram, Pinterest, and LinkedIn. They’ll help you develop brand awareness with more followers, build relationships through meaningful engagement, and increase website exposure with added traffic. Lyfe Marketing primarily deals with social media management, but also offers pay-per-click and SEO marketing, web design, and social media advertising. This gives you the confidence that they have the resources to manage your accounts, as well as the option to branch out in the future if your company grows. If you’re a small business looking to get a boost on social media, Boostability is designed for you. It’s staffed by experts in social media management who can help you be more relevant and visible on platforms like Facebook, Twitter, Instagram, and LinkedIn. Boostability has an impressive selection of analytical and reporting tools that will help you understand exactly what social media management is doing for your business. Additionally, because they focus on search engine optimization as well as social media management, you know that Boostability will have the knowledge to truly make a difference on your next campaign. Focusing exclusively on Facebook isn’t a terrible idea as a business, especially considering that it has more than one billion daily users. With the right strategy, you can reach a massive target audience with few resources, little energy, and on a budget. This is where Hibu comes in handy. This Facebook-exclusive platform focuses all their expertise on the mammoth platform make sure you’re getting the most out of it. With targeted ads, optimized business pages, and tangible data, Hibu will turn your Facebook presence into the ambassador for your brand that it’s supposed to be. Plus, with one-on-one consulting available, your vision for social media won’t get lost in the shuffle. While a jack-of-all-trades agency can be right for some companies, there’s no shame in wanting a social media management service that only focuses on social media. With SociallyIn, you’ll get the expertise only found on teams exclusively paying attention to platforms like Facebook, Twitter, Instagram, and LinkedIn. They’re tapped into ongoing trends like influencer marketing, and can improve your strategy without you having to lift a finger. By researching your industry and developing campaigns based on that research, SociallyIn produces results that you can see on your bottomline as well as in your brand authority. They’ll also help you set goals so that the future of your social media presence doesn’t collapse along the way, and that’s more important than anything. Exclusively focusing on Facebook is one thing, but an all-encompassing social media strategy with a primary focus on Facebook covers a lot more bases. With Bad Rhino Inc, you’ll be able to make an impact on platforms like Twitter, Instagram, and LinkedIn, while still keeping your resources focused on social media’s white whale. With data-focused strategies and expert storytelling, Bad Rhino takes a more informal approach to getting your name out in the world via social media, thanks to their “we don’t bullsh*t” attitude. They make sure you’re involved in the process, so their expertise will be informed by your knowledge about the company. 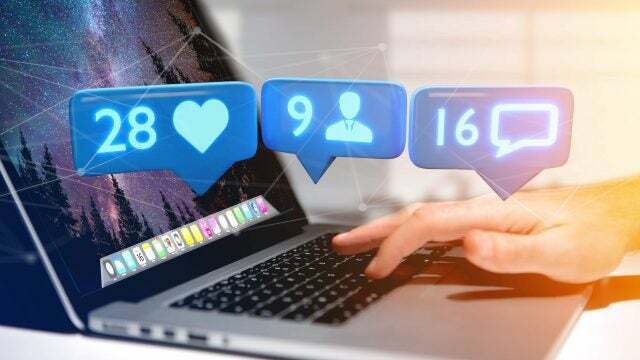 Conducting business on social media has become more than just an added benefit to your bottomline; it’s now a necessity for businesses looking to stay competitive. People from all walks of life have become using platforms like Facebook, Instagram, and Twitter to inform purchasing decisions like never before. 73.4 percent of social media users follow a particular brand because they’re interested in their product or service. 70 percent of Gen-Xers are more likely to make a purchase from brands they follow on social media. Outside of these convincing statistics, social media management really can make a huge difference for your company. In addition to providing an open funnel for customers to communicate with you, social media gives you a way to increase brand awareness, improve brand image, launch new products faster, and even publicize sales and giveaways. In so many words, social media can be whatever you need it to be, as long as you have the knowledge and resources to pull it off. Running your company’s social media might seem like an easy task to handle on your own. After all, how hard is it to post articles, comment on statuses, and respond to messages in a timely manner? Well, unfortunately for you non-experts out there, establish your company on social media takes a lot more than a few posts and a couple likes. Social media management services combine expert knowledge, committed resources, and industry know-how to create meaningful content, build engaging campaigns, and foster relationships between your company and its followers. Yes, social media management tools that you run yourself can help you save a little time and energy when it comes to platforms like Facebook, Twitter, and Instagram. However, without training, you could just end up making the same mistakes on a grander scale than before. With social media management services like these, you’ll be able let the experts handle everything while you focus on the big picture. Which Social Media Platform is the Most Important? Let’s cut to the chase; it’s Facebook. With more than 2 billion monthly active users and more than 1 billion daily active users, Facebook provides the most obvious avenue to new customers, effective customer service, and an improved bottomline. From affordable advertising options to thorough analytics, utilizing Facebook to promote your business isn’t just easy, it’s effective. According to research, Facebook is the second highest rated platform for ROI when it comes to advertising, with Google Search taking the top spot. And when a social media platform competes with a search engine for ROI, you have to take notice. Which Social Media Platform is the Least Important? Despite Facebook’s obvious spot at the top, there is no definitive ranking of social media platforms, particularly when it comes to business. If you’re trying to decide which platforms aren’t worth the investment, you’ll have to look at exactly what you’re trying to accomplish with social media and what kind of customers you’re trying to attract. For example, if you recently launched a clothing startup, setting up a business account on Pinterest, you could attract a wide range of new customers interested in improving their fashion sense. However, if you’re a B2B software provider, Pinterest isn’t going to do much to help you improve your bottomline. Simply put, it’s up to you to figure out which social media platform is the least useful for your business. However, a general rule is that the smaller the audience, the less necessary at platform is for your business. Cost is one of the most important factors when it comes to deciding whether or not social media management is right for you. The right service will be able to save you time and energy, but if the cost is too high, what’s the point? That’s why understanding the price of social media management services is integral in making your decision. The most significant aspect of pricing when it comes to social media management services is which platform you’re looking to focus on. Facebook, Instagram, Twitter, Snapchat, Pinterest, LinkedIn and pretty much every other social media platform will come with a different price tag, so make sure you know which platforms you’re interested in before you make a decision. Likewise, social media management services come with a wide range of features, that can greatly affect the cost. If you’re just looking for a company that can schedule posts and respond to comments, the price will be on the lower side. However, if you’re looking for a service that will take care of everything, including your social media strategy, you might end up spending a little extra. Deciding which social media management service will make the biggest impact for your company isn’t easy, but we hope that we made it a little easier. Either way, these services are designed to bring social media prowess to businesses like yours, and which ever one you pick will do just that. However, the only way to know whether or not a social media management service is right for you is to get a quote today. You’ll be able to fully understand how much one of these services will cost you in pursuit of a better, more complete social media presence. The post Best Social Media Management Services appeared first on TechCo. 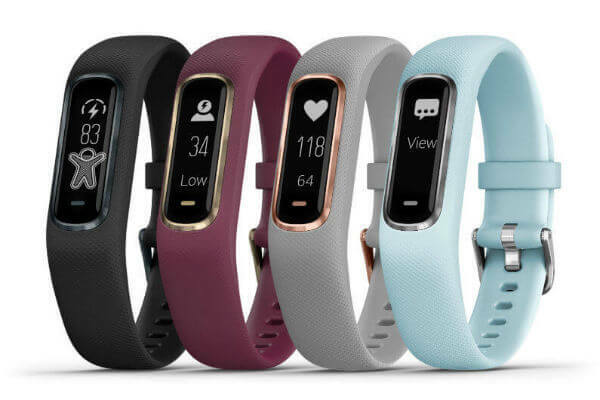 Garmin has announced a new fitness tracker, the Vivosmart 4, and it promises to offer advanced health-tracking functions whilst retaining a sleek silhouette. We take a look at the Garmin Vivosmart 4 features and compare it to rivals such as the Fitbit Charge 3. The new Garmin fitness tracker will replace the Vivosmart 3, but will cost slightly more at $129.99 – understandable, given its improved roster of health tracking features. These include Pulse Ox, which will estimate the volume of oxygen in your blood. It’s available to order now, but won’t be delivered until at least the middle of September. So what do you get for the near $130 price tag and, if you already have a Vivosmart 3, should you upgrade? We answer these, and all the other important questions about the Vivosmart 4. Is the Garmin Vivosmart 4 a Smartwatch or a Fitness Tracker? It’s closer to a fitness tracker but, as we’ll explain below, it’s not the most exercise-focused wearable out there. Instead, think of it more as a health tracker. You’ll still be able to receive notifications from your smartwatch, as well as check the weather, control your music, find your phone and reply to texts with preset responses (Android phones only). What is Garmin Vivosmart 4 Pulse Ox? Pulse Ox is the headline feature of the Vivosmart 4, and with good reason. Pulse Ox gives you a much deeper understanding of your health by observing how your body absorbs oxygen, rather than simply measuring your resting and active heart rate, like other fitness trackers. You’ll be able to take a snapshot of your blood oxygen level at any time, or use it overnight to assess your sleep quality. Does the Garmin Vivosmart 4 Track Your Heart Rate? Yes, the Vivosmart 4 will track your heart rate. It’ll also give you the ability to see your heart rate zones, how close you are in % to your maximum heart rate and will give you alerts for heart rate abnormalities. What Sports Can the Garmin Vivosmart 4 Track? The Vivosmart 4 is less focused on tracking performance in individual sports than some wearables, instead taking a broader look at your overall fitness. However, the Vivosmart 4 will automatically detect when you’re walking, swimming, cycling or training on an elliptical machine and send all the data to the Garmin Connect platform. Does the Garmin Vivosmart 4 Track Steps? It certainly does. And, in addition to helping you meet that 10,000 daily steps target, the Vivosmart 4 will help you track the number of floors you’ve climbed, calories burned, your active minutes throughout a day and more. It’ll also let you know when you’ve been sitting still for too long, with regular move reminders. How Large is the Garmin Vivosmart 4? The Vivosmart 4 is available in two sizes: small/medium or large. The small/medium size will fit wrists with a circumference between 4.8-7.4 inches (122-188mm) whereas the large will fit wrists between 5.8-8.4 inches (148-215mm). The small/medium Vivosmart 4 weighs in at 20.4g and the large version tips the scales at 21.5g. The screen is 0.74-inches across the diagonal on both sizes. What Colours Does the Garmin Vivosmart 4 Come In? Gray with a rose gold buckle and screen case Berry with a light gold buckle and screen case Azure blue with a silver buckle and screen case Black with a midnight (black) buckle and screen case. The Large Vivosmart 4 is only available in black, with midnight accents. When is the Garmin Vivosmart 4 Available? You can buy it now from Amazon or directly from Garmin. However, you’ll need to be prepared to wait. Deliveries are expected to begin in 3-5 weeks – around the end of September or beginning of October. How Much Does the Garmin Vivosmart 4 Cost? It’ll set you back $129.99. That’s $10 more expensive than the Vivosmart 3 it’s replacing, but we think the price hike is justified given the extra features. How Long Does the Garmin Vivosmart 4’s Battery Last? 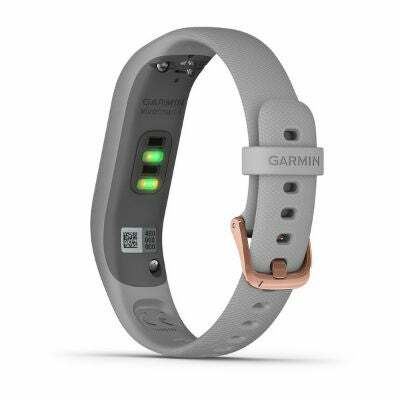 Garmin claims that you’ll see up to seven days on a single charge. However, it also notes that if you decide to activate the pulse ox sleep tracking, this will decrease. Is the Garmin Vivosmart 4 Waterproof? Yep, you’ll be able to take it in the shower or the pool without it taking damage. However, we’d avoid taking it in open water like the sea, for example. Does the Garmin Vivosmart 4 have GPS? Nope, the Vivosmart 4 doesn’t offer built-in GPS or even connected GPS via your smartphone. What Other Health Tracking Features Does the Vivosmart 4 Offer? The Vivosmart 4 also introduces an energy monitor known as Body Battery. This monitors the body’s energy reserves, letting users know the optimal time for activity and rest. It assesses the energy levels using a combination of stress, heart rate variability, sleep and activity data. Should I Get a Garmin or a Fitbit? While Fitbit is probably the biggest name in wearables, Garmin has established itself as major player in the market in recent years. However, the new Garmin Vivosmart 4 is a slightly unusual proposition. It doesn’t claim to track loads of sports with pinpoint accuracy, instead seeking to give you a more rounded, holistic view of your health – keeping track of sleep, stress and overall fitness levels to help you stay healthy. It’s not as great a choice for tracking exercise. One of its big rivals will be Fitbit’s new Charge 3, which launched last week. It’s slightly different in approach to the Garmin, but they’re similarly priced and it should offer a premium wearable experience. If all you want from a wearable, though, is simple activity tracking, you may be better off getting the cheaper Fitbit Flex 2 or Garmin Vivofit 4. Again, if you’re after in-depth sports tracking, you’ll need to pay more for features like GPS tracking. Alongside the Fitbit Charge 3, the Vivosmart 4 isn’t short of rivals. 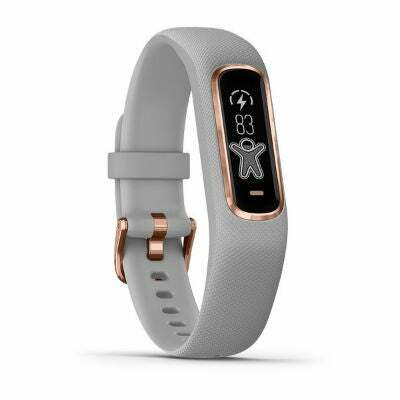 In fact, within the Garmin range itself is the Vivosport tracker, costing $169.99, which has more advanced sport tracking than the Vivosmart 4, in a similar form factor. Garmin also offers the Vivomove HR, which costs $199.99 but combines classic wristwatch looks, with some of the activity tracking smarts found on the Vivosmart 4. Outside the Garmin stable, you’ll find a host of rival smartwatches and activity trackers which, while not offering exactly the same experience as the Vivosmart 4, they do offer some of the same features. For example, Samsung recently announced its new Galaxy Watch which, using the Korean company’s new Samsung Health platform, offers sleep and stress tracking. Apple also announced big improvements to its popular Apple Watch models, allowing for yoga workouts and guided breathing exercises. We’re also expecting Asus to release its unprecedented, non-invasive blood pressure-monitoring smartwatch, the VivoWatch BP before the end of 2018, after announcing it a few months back. To read more about the best wearables you can buy this year, check out our Best Wearables for 2018 guide. Or, if you’re sold on the Garmin Vivosmart 4, you can buy it here. The post Garmin Vivosmart 4 – Everything You Need to Know appeared first on TechCo.